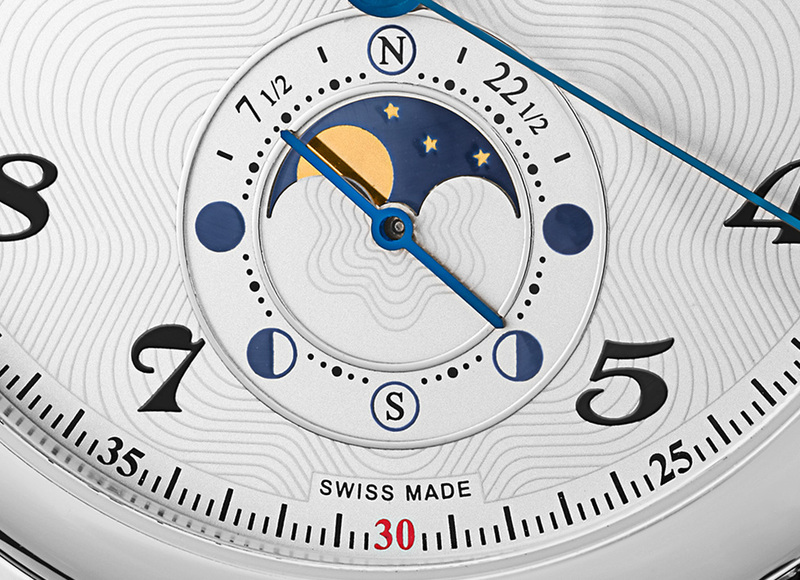 At SIHH 2014 Montblanc will unveil the Star Twin Moonphase, featuring a moon phase display showing the age of the moon in both the Northern and Southern Hemisphere, as well as a pointer date. SIHH later this month will be the first for Jerome Lambert, who took over as CEO just over half a year ago. One of the new watches that will be unveiled at the fair is the Star Twin Moonphase, an automatic with a moon phase and date display, a modest complication at a modest price. The base movement is an ETA calibre, probably the 2892, with a module on top developed for Montblanc (likely by Dubois-Depraz) which indicates the moon phase in both hemispheres. That’s because the moon appears differently depending on which side of the equator it is observed from. In each hemisphere, they are essentially mirror images of each other so when the moon’s crescent curves to the right in the Northern Hemisphere, in the Southern Hemisphere it curves to the left. The moon phase display here has a semicircular aperture showing the moon phase in the Northern Hemisphere, while the blued steel hand indicates the moon phase in the Southern Hemisphere. Both naturally run in sync, since the moon progresses in the same fashion regardless of the hemisphere. 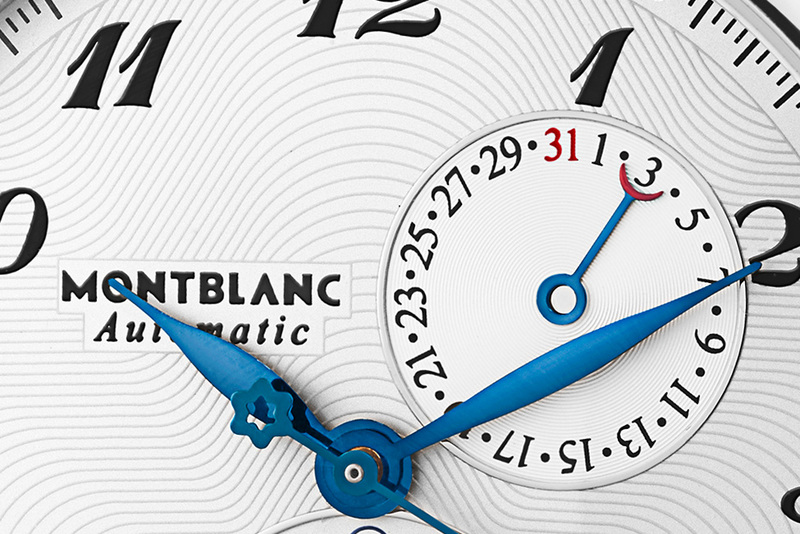 The dial is decorated with guilloche which echoes the Montblanc star logo, and at two o’clock sits the date sub-dial. Both the date and moon phase are set via pushers in the case, which is steel with a 42 mm diameter and a sapphire display back. Pricing has yet to be announced, but with a similar Star Moonphase automatic retailing for US$5380, expect this to be in the same ballpark. Delivery is expected in autumn 2014. – SJX Follow us on Facebook, Instagram and Twitter for updates and news. 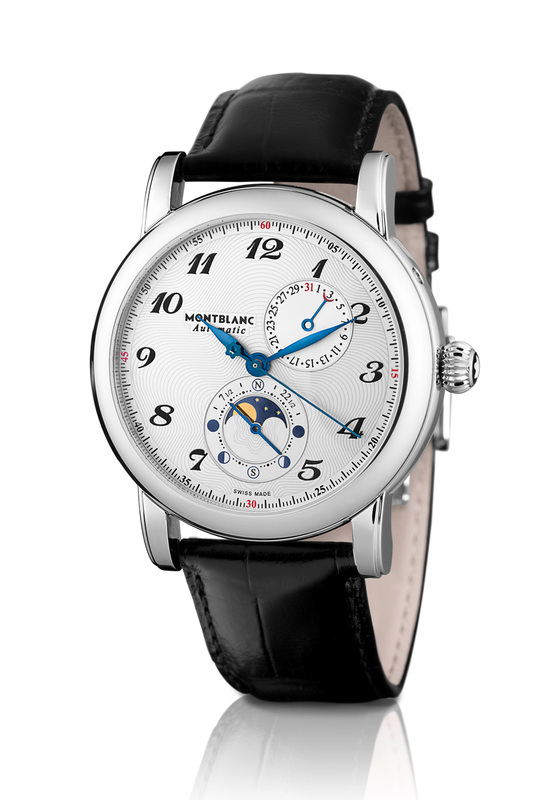 Montblanc has redesigned its signature chronograph and given it a a more restrained and elegant aesthetic. Created in tribute to the inventor of the chronograph, the new Montblanc Homage to Nicolas Rieussec is a monopusher chronograph with second time zone, and unusual hidden hour indices that glow only in the dark.